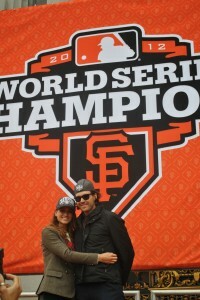 Barry Zito and his wife Amber Seyer celebrate the Giants’ championship and his hitting exploits. The outlook wasn’t brilliant as the Giants left the Bay. They trailed the Reds by two games in Division Series play. But they rallied in game three; in game four they did the same. Then Buster’s bat and Sergio’s save thrilled patrons of the game. flew back to San Francisco to play the NLCS. Not knowing “never say die” was the San Francisco pledge. 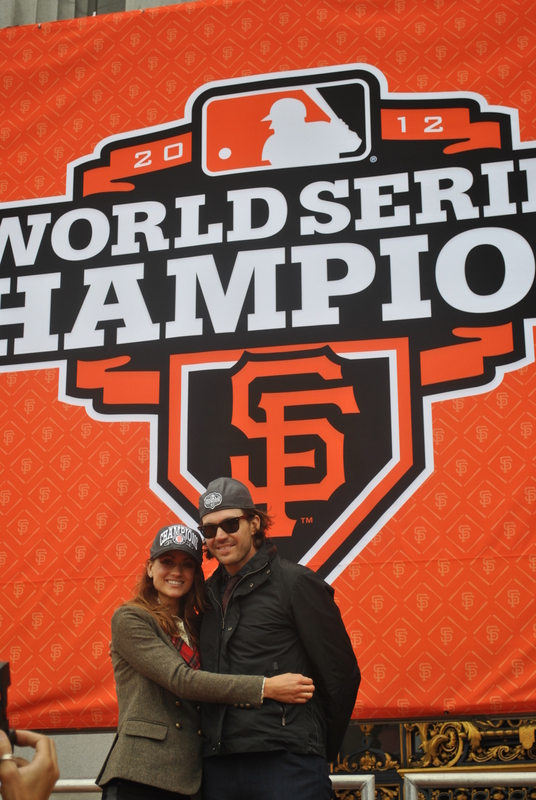 In the fifth game, Zito pitched to the wonderment of all. Then Barry, much maligned batter, bunted a perfect ball. Zito, safe at first, had knocked home Gregor Blanco from third. Game six saw Vogey and Scutaro bring the Giants back. Another win would give the pennant to the orange and black. It rumbled through the ballpark in a seventh, final bout. Slumping Hunter had left many runners on the bases. Then Pence hit a pitch three times to put smiles upon fans’ faces. Back to the World Series while the Cardinals flew home and wailed. The Fall Classic! Millions saw the Giants and Tigers play. Most applauded when Panda ruined Verlander’s big day. ‘Til Barry knocked another in, and Leyland ate his hat. Bochy made all right moves in the timely winning spree. 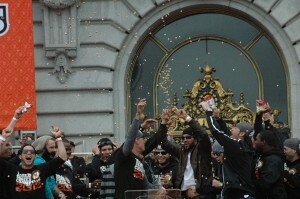 That the Giants shone, even Joe Buck had to agree. Made the Tigers look like kittens locked up in a zoo. And Detroit’s Miguel Cabrera stood a-watching it there. Through the strike zone flew the ball as Miggy held his bat. “Strike three, yer out!” the umpire cried. That was the end of that. 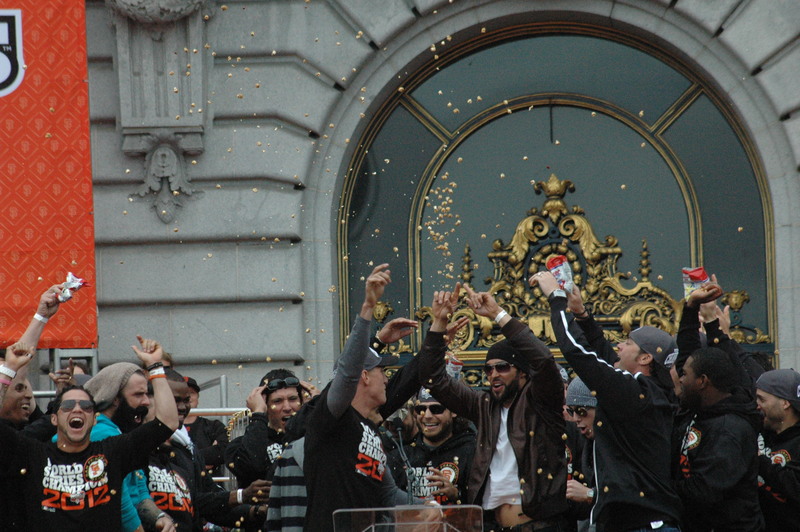 The Giants, 2012 World Series champions, perform their pregame ritual. Like the joyful cheers the fans made just two years before. Here in this favored land, fog lifts. The sun is shining bright. Bands are playing everywhere, and the fans all feel just right. There is no joy in Cincy, St. Louis nor in LA. But the Giants are world champs! Who’d the Dodgers play today?